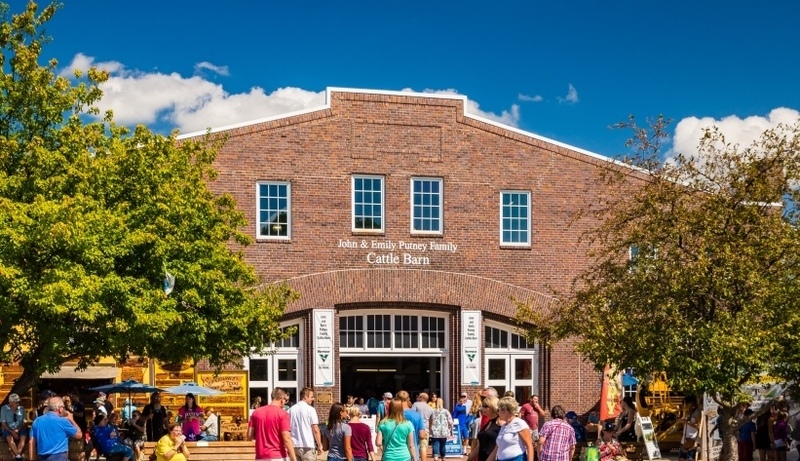 The Cattle Barn, covering 154,000 square feet with room to hold up to 1,300 head of cattle, is one of the most commanding structures on the Fairgrounds. The im­posing brick edifice was built in two major stages, in 1914 and 1920, uniting the original north and south barns and adding the Sale Ring/Media Center. Renovations to the Cattle Barn include a new roof, replacement of all gutters and downspouts and a new concrete floor in the foyer area. Additionally, both the north and south ends of the west side were extended 35 feet to the sidewalk in 1999. These annexes are used for a wide variety of consumer events. The Penningroth Media Center, also located in the Cattle Barn, acknowledges a contribution by the Penningroth family who exhibited swine and cattle at the Fair for more than 60 years. In 2013, the Cattle Barn was rechristened in honor of out-going Executive Director of the Blue Ribbon Foundation and former President of the Sale of Champions John Putney. In 2018, the overhead doors on the west side of the barn were refurbished by replacing rotting wood and receiving a new coat of paint.